I think that most of us had someone special in their young lives; someone not their parents, but another family member that would treat you like it was your birthday every time they saw you. For me, it was an elderly aunt who always made me feel special. She would hug me like no other whenever she’d see me, and I’ve never forgotten her. Olón, Ecuador, is a special place just like that. The quaint little beach town embraces you like your favorite aunt, and it isn’t easy to leave once you’ve spent some time here. It’s a comfortable place, a town where the locals are friendly, and the expat community has a strong and active presence. It’s a “forever” home if that’s what you’re looking for, and it might change your mind about wanting to be somewhere else any time soon. Living in Olon is a terrific experience! You’ll witness a parade of people from all over the World, who, like you, fall in love with the “tranquilo” lifestyle, and can’t find a good reason to leave. Many who leave always find a way to come back, or they stay connected, because this place gets into your blood like no other! You’re wondering “what’s so special about this place?” aren’t you? 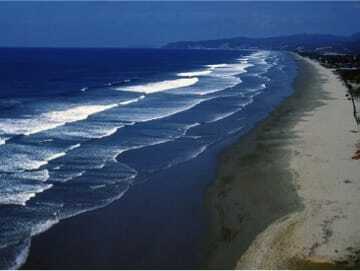 If you search the internet to research the beaches of Ecuador, you won’t find a lot of differences in the offerings. Ecuador has an endless supply of beautiful beaches, stretching all along its coastline, from south to north, and all of them look awfully nice when shopping for a place to hang your hat. It seems that making a choice is a difficult task, but you keep researching, hoping to find the best one. And then, if Lady Luck is shining on you that day, you discover Olón! You can start with the beach itself. Playa Olón is part of a continuous stretch of white, powdery sand that stretches from the cliffs of the Santa Maria del Fiat Church and Orphanage, and goes north into the town of La Entrada, where the coastal mountains meet the sea, and the beach ends. It’s miles and miles of great beach, and offers everyone the chance to walk it, jog on it, relax on it, well, you get the picture! It’s a slice of Paradise, and it’s waiting for you to claim your share! You will see people enjoying the beach every day of the week here in Olón. During the High Season, “La Temporada Alta,” you’ll be part of a diverse crowd who come here to share in its beauty, and in the low season you’ll have the beach to yourself. It’s common to meet people here from as far away as Quito to the north, and from Vilcabamba to the south, hours away, who make Olón their first choice for a beautiful vacation. 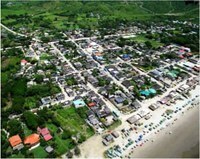 Many of our visitors come here from Guayaquil, two hours to the southeast, because it’s the nicest beach on the coast! Even though there are other beaches to stop at that are closer, these natives come here to enjoy the sun, sand and great food: all great reasons to come to Olón. Food? Did I just mention food? Let me tell you about the incredible number of great restaurants in Olón. There are lots of small towns along La Costa, with sunny beaches and friendly people, but none of them offer the variety of food that Olón and its beach can give you. If it’s Ecuadorian food you want, you’ll have so many options you’ll go hungry while trying to make your decision! But, if you’re on your game, you’ll sit down at any of the cabana restaurants on the beach and just enjoy “la comida típica ecuatoriana” (typical Ecuadorian food). It’s all good! There are at least twenty cabanas serving food on the beach on weekends, with less during the week. Tucked in on the beach in front of the restaurants there are probably ten “Tiki bars” serving an assortment of fresh fruit juices and killer alcoholic beverages, of course! But if you just want to drink some fresh coconut juice, then you can find that here, too, with several vendors who will chop the top off a recently-picked coconut and stick a straw in it for you. The simplicity and taste of a freshly cut coconut is terrific, and it’s extremely healthy for you, too. Options! Options! Options! For those of you not familiar with typical Ecuadorian food, and are wondering what that might involve, let’s just say lots of fresh seafood, rice, salad and patacones (made from green plantains, a local staple). Olón has been a fishing village for many years; for centuries actually, so seafood from the boat to you is what you’re going to get. It doesn’t get much better than that. The local pescadores, or fishermen for the uninitiated, launch their rustic boats directly into the waves and head out to one of the offshore reefs, where they’ll spend the entire night casting and netting the local delights. Some nights you can see the lanterns shining from dozens of working boats. It’s amazing! Besides fish, the harvest may include squid, crabs, or spiny lobster, depending on the seasons and the water temperature. The Pacific Ocean and Pachamama (Mother Nature) are generous most nights, and we’re all very appreciative of her bounty. If you get off the beach and wander around the town, you’ll be astonished by how many other great options there are in our little town. You feel like having a pizza and a beer? No problem; there’s a few places for that. Great cheeseburgers? Yep, got that covered, too. There are several great dining places scattered throughout the town, so getting dressed up for dinner is fine, except that we don’t need to get dressed for dinner here. It’s totally casual all the time! Just eat and enjoy! We have great bakeries here, too, that serve up local favorites like chocolate bread (pan de chocolate), cakes and pies, and we even have one that makes delicious French baguettes (seriously good!) We have a great spot with artisanal beers on tap who also feature a great selection of cheeses, something that isn’t easy to find in most towns along the coast. Olón has an abundance of fresh food in a variety of locations. Fresh fruits and vegetables are available at several markets around town, with plenty of places to buy fresh chicken and pork, sausage and hamburgers. A seafood market on the highway offers up the morning’s selection of fresh catches from the night before, and small tiendas (corner stores) are scattered everywhere in town, where you can pick up whatever else you might need. You can’t go hungry here unless you want to! So, let’s check things off our “Needs” list. Great beach; yes. Great food; yes. Lots of choices for great food; yes. Bakeries with amazing goodies; yes. Fresh fish, fruits, veggies, meats, chicken; yes. Okay, we’ve got it all covered, don’t we? Oh, wait a minute; we didn’t talk about the wonderful people who live here.Many of the people here are part of the local history. Their families have been here for centuries, plying the waters of the Pacific, and farming the lands nearby. Because of this, finding ancient artifacts is quite common. Buried treasures are everywhere, remnants of the previous civilizations that called this area home. In fact, the Olón Water Department has a museum of cultural significance, showcasing hundreds of historical pieces, including human skulls, they’ve found when digging new lines for water and sewer pipes. It’s definitely worth a visit when you’re here! seventies during the day, and sometimes slip into the mid-sixties at night. During the summer period (January through May) the days are normally in the eighties, with a bit of cooling at night. Most residents will tell you that it’s a very comfortable place to live. Personally, I’ve worn jeans here only one night since I arrived two and a half years ago. I have worn shorts the entire time except for that one night! So, it’s okay; you can leave your snow shovels behind! Come to Olón! You just might not leave! 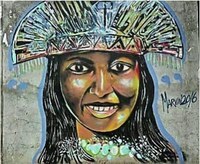 Fondly referred to by gringos as the Mayor of Olón, author Mark Bradbury has been living in the tiny fishing pueblo for the past two and a half years. He enjoys the tranquilo lifestyle and wouldn’t trade it for anything.